You’re bound to find the car of your dreams within the inventory of Chevy convertibles at Sunrise Chevy! From the classic Chevy Camaro to the sleek Corvette convertible, these impressive vehicles are just as stylish as they are powerful. Take a spin in a new convertible at our dealership in Glendale Heights, near neighboring Carol Stream and Bloomingdale. If you’ve always dreamed of owning a Chevy convertible, then there’s no time better than the present to get behind the wheel. Maybe you’ll fall in love with the 650-hp ZL1 Camaro convertible with its remarkable 0 to 60 mph time of just 3.5 seconds. Or maybe you’d prefer the latest Corvette convertible with available luxuries like Napa leather seating, Performance Data Recorder, and navigation. Are you ready to experience the exhilaration of Chevy convertibles? Contact us at Sunrise Chevy at any time! Prefer a coupe option? 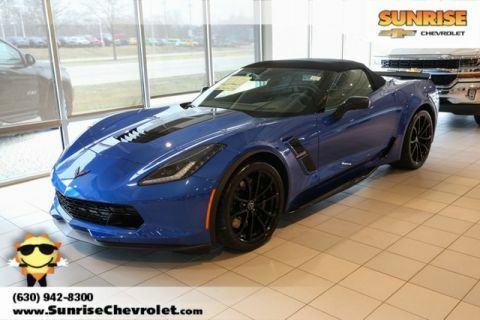 Check out our Chevy Corvette coupe inventory.